Does your family love Transformers as much as my family? My son, especially, loves Transformers, as they are like a puzzle for him! We recently got to review a Transformer Beast Hunter, and we just love it! 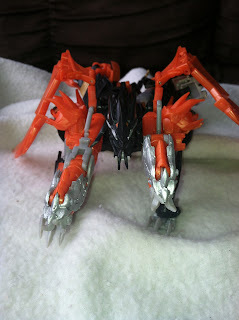 The Transformer Beast Hunter turns from a "robot" to a "beast". The one we reviewed turned into a dragon, which my entire family loved! We are really into dragons right now, so it was perfect. MamaBreak received a Beast Hunter to review here on the website. We did not receive any other type of compensation. As always, our opinions and experiences are our own. Want to win your own? We thought so! Enter below! All Transformers toys "look cool" but I have to say I like the Purple one best. I had trouble finding the actual toys on this link. My nephew would probably say megatron! Totally the Optimus Prime Battle mask!!! My son would love them all! They are all amazing but I personally think Transformers Prime Beast Hunters Voyager Class Shockwave is the nicest. I like the optimus prime! I think the coolest one is Transformers Beast Hunters Deluxe Class Bulkhead Figure. The Dragon Beast Hunter looks coolest. Predaking is my favorite(since I collect dragons) but I also like skystalker. My son loooves Bumblebee!!! He would love this! 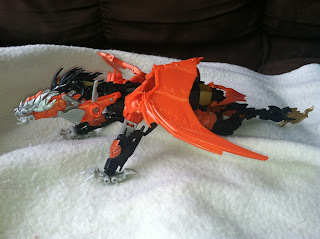 I think the Dreadwing looks pretty cool, though my girls would probably pick out Optimus Prime.